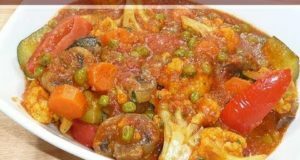 Baked Vegetables in Spinach Sauce, ideal dish for kids and adults! Baked Vegetables in Spinach Sauce is a sumptuous preparation of assorted vegetables in a creamy sauce that is reinforced with spinach puree. The spinach adds a new dimension to the white sauce, making it more colourful and tastier too. 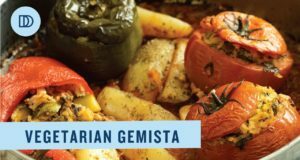 Myriad veggies add flavour, crunch and a delightful splash of colours to this dish, which is a perfect accompaniment for garlic bread. Baking time: 15 to 20 minutes. 1. Pour ¼ cup of water in a kadhai, allow it to boil. 2. Add the spinach and sauté on a high flame for 1½ minutes or till the spinach is soft. 3. Remove from the flame, allow it to cool and blend in a mixer to a smooth purée. Keep aside. 4. Heat the butter in a broad non-stick pan, add the plain flour and sauté on a medium flame for 1 to 2 minutes, while stirring continuously. 5. Add the milk, mix well and cook on a medium flame for 1 to 2 minutes, while stirring continuously. 6. Add the salt, mix well and cook on a medium flame for 1 to 2 minutes, while stirring continuously. 7. Add the spinach purée, mix well and cook on a medium flame for 1 minute, while stirring continuously. 8. Switch off the flame, add the pepper powder and mix well. 1. Combine the prepared spinach sauce, boiled vegetables, salt, pepper and cream, mix well and cook on a medium flame for 1 t o2 minutes, while stirring occasionally. 2. Pour in a 175 mm. (7″) baking dish and sprinkle the cheese all over and bake in a pre-heated oven at 180 °c (360 °f) for 10 to 15 minutes.